For the last few years (with the exception of a few 80s and 90s kickback moments, a little Michael Jackson here and there and a few Indie bands) for the most part I listen to Christian music. So although I was vaguely familiar with her drug and alcohol problems, I was otherwise pretty oblivious to Amy Winehouse and her music. That is until a few days ago when the news hit the she’d passed away. Reading online articles written about her tumultuous lifestyle was really just sad, but I think what was worse was reading comments from the general public written in response to those articles. Disrepsectful and just down right cruel things that people said really just turned my stomach. For sure she had drug addictions, alcoholism, and a potty mouth but that doesn’t remove the fact that a mother and father had to bury their daughter today. I just felt heavy with grief as I thought about this life stolen away by addiction…at all the lives lost and moments lost to some form of addiction every day in this world. I was sharing all this with my soul sister Mandi at our Tuesday morning coffee time this morning. She shared with me about this homeless fella she and her fiance’ Jeremy had met over the weekend. They’d gotten him something to eat and talked to him about Jesus. It would have been just as easy to judge him…or any homeless person for that matter. We can’t always know what gets a person into that kind of predicament but it’s not uncommon for it to be the result of feeding an addiction that wins out over jobs and houses and families. But God reminded me today that we all have our vices…our addictions. And He has grace to cover them all. And without Him, we are all trainwrecks. Without Him we are all lost. Did you catch that switch? In the first part, they are called disciples but in the second part they are called apostles. So we looked up the two words. Turns out the root word of “disciple” means “to learn.” The word “apostle” means basically “one who has been sent on a particular mission.” All their learning from Jesus wasn’t just for their own benefit. He taught them and then gave them His authority and they were sent on their mission. We have been given that same authority and mission. A real live, flesh and blood sheep, ya’ll. At first I was as little concerned about what might have been in my coffee, so I was somewhat relieved when Mandi and the other handful of folks there saw it too. And this sheep was scared. I could see it shaking. It ran into the corner out on the patio area and then darted back to the door and back to the patio again. 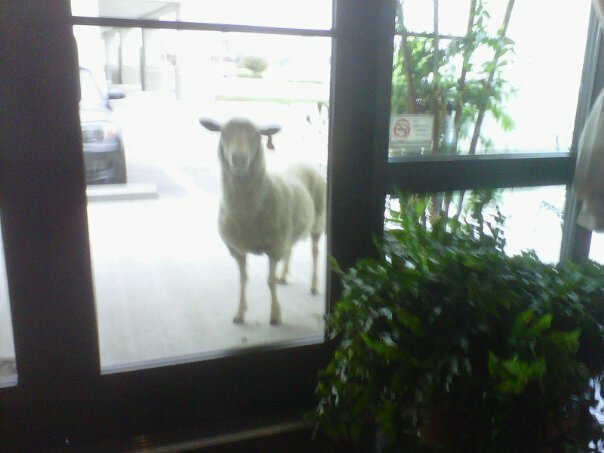 When a couple of folks walked outside to get a closer look, the sheep ran off…by way of the drive-thru. Insane I tell you. The sheep had a yellow tag in it’s ear with the number 102. 1. There is a time to learn, and a time to use what you’ve learned. We need to study the Word and spend time with the Father in order to learn, but at some point the time comes for us to go and tell what we’ve learned to someone else. We are not just called…we are also sent. 2. We all need a Savior and although ultimately the choice is ours, God’s heart is to be reconciled with all of mankind. There is none too far gone for His grace, no heart too black to be washed white as snow by the blood of Christ. 4. God is an incredibly amazing God who uses the craziest things to get our attention sometimes. As “sent ones,” we’ve got places to go and people to see. God is too good, His Word is too alive, His grace too abundant for us not to tell others about Him. He is the Overcomer in the face of addiction, the Mighty One who tears down strongholds, the Redeemer who takes our broken mess and breathes new life into us. My post-sheep-sighting prayer would be that you and I would never get tired of teaching others about the goodness of the Lord, of showing His love and compassion to others, of telling the lost sheep about the Shepherd. We all had to learn our name sometime. Awesome word Jenny!! We need to be ready at ALL TIMES to tell the world about HIM! Maybe it was a reminder to all of us about how many lost sheep there are in this world that need help.